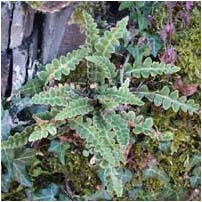 A small tufted fern with linear-lanceolate or linear-oblong, pinnatifid, fronds, the rounded lobes alternating in a zig-zag fashion; deep green above, the underside densely covered with with scales that are silvery-white when young, turning reddish-brown; found on mortared walls and limestone rocks throughout much of the British isles, although commonest in the west and south west of Britain and throughout Ireland. habit: plants grow in dense tufts from a short rhizome; the fronds are wintergreen and survive drought by curling up, when they become brown and appear dead, but recover quickly in wet weather. size: generally 3-15cm in British plants, but up to 20cm in western Ireland. leaf: deep, slightly greyish-green above (although paling to yellowish-green in very exposed sites) with a few scattered scales; underside thickly covered with overlapping scales (giving an initial impression of dense hairiness), silvery-white at first, becoming reddish-brown later; linear-lanceolate or linear-oblong, tapering somewhat at each end; pinnatifid, the lobes alternate, fully attached at the base and connected to the adjacent lobes, short, with rounded ends, entire or with rounded teeth (crenate); plants with crenate lobes are commonest in Ireland and to a lesser extent in south and west England and west Wales. stipe: short, usually 1/4 as long as blade or less, covered with scales. scales: on rhizome and lower part of stipe, dark brown to blackish, lanceolate, acuminate; on upper part of stipe a mixture of the former and scales similar to those on the underside of the blade and intermediate types; on underside of blade, ovate-acuminate, overlapping, silvery-whire when young turning reddish-brown later. sori: linear, along veins, but mostly hidden by scales. indusium: none, or only rudimentary. identifying features: dense covering of scales on the underside of the leaves, strongly-alternate zig-zag lobes and tufted habit; a fern that once seen will not be confused with any other native species. habitat: on limestone rocks, and mortared walls. Plants on mortared limestone wall, Oxfordshire, May Plants on mortared limestone wall, Oxfordshire, May. Note the current year's fronds unfurling in the centre of the previous year's fronds. Plants showing effect of drought, Oxfordshire, July. They are still alive and will turn green again after rain. Another plant on the same wall.